ESCANABA — Preparations are underway for the 12th Annual UPtoberfest, which will take place Oct. 14 at Escanaba’s Municipal Dock from 2 to 7 p.m. 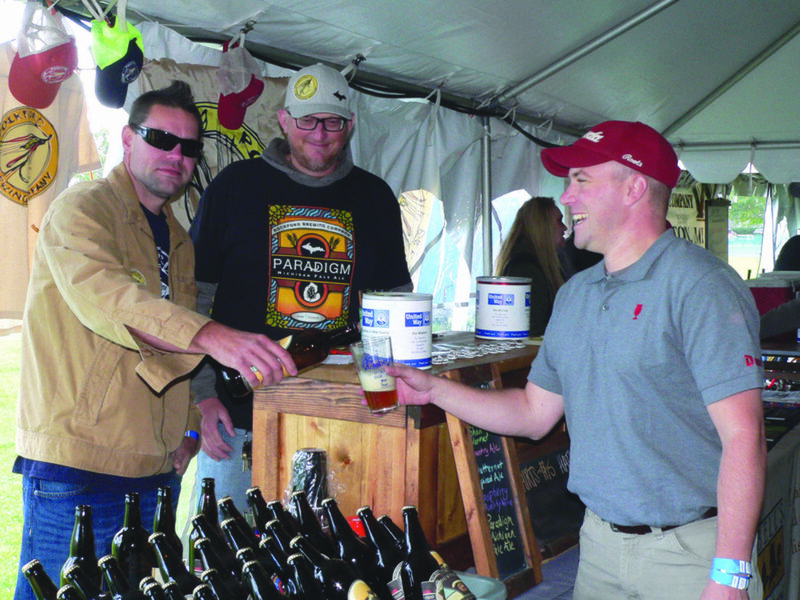 The event, hosted by local homebrewing group Bay de Noc Brewers, gives people in the area a chance to enjoy a variety of Michigan-made craft beers and wines while supporting the United Way of Delta County. This year’s UPtoberfest will be the ninth organized entirely by BDNB, the group’s president Ben Harris said. “Planning is going smoother than it ever has in the past,” he said. According to Mark Ammel, a member of BDNB and the owner of Bobaloon’s Cafe, the process of planning 2017’s UPtoberfest began this summer. “We (started) official meetings in early July,” he said. Some changes are made to UPtoberfest each year. For this year’s festival, BDNB will introduce a make-your-own-pretzel-necklace bar. “It’s a creative take on a traditional beer festival staple,” Ammel said. This year’s UPtoberfest will also feature a slightly larger tent. However, many other elements of the festival will remain unchanged in 2017 — including its focus on giving guests an opportunity to taste some of Michigan’s finest beers and wines. “(It) will be heavily focused on wineries and breweries of the Upper Peninsula,” Harris said of the lineup of beverages that will be featured at this year’s event. Breweries that will have a presence at this year’s UPtoberfest will include Upper Hand Brewery and Hereford and Hops of Escanaba, Blackrocks Brewery and Ore Dock Brewing Company of Marquette, Cognition Brewing Company of Ishpeming, and Short’s Brewing Company of Bellaire, among many others. Other elements returning to this year’s festival from previous UPtoberfests will include free hors d’oeuvres from Bobaloon’s — including roasted pig, fresh-cooked pork rinds, smoked beef brisket, fresh bratwurst, and Wisconsin cheeses — live music by Escanaba-based band ToHuBoHu, brewing demos, and games. Additionally, proceeds from the festival will once again go to the UWDC. “Really, it is for a good cause at the end of the day,” Harris said. UWDC Executive Director Julie Mallard said she appreciates UPtoberfest’s support of the United Way. “We’re grateful to be the non-profit that benefits from this event,” she said. According to Mallard, the last two UPtoberfests have raised about $10,000 each for the UWDC. “That makes it the largest fundraising event for (UWDC),” she said. Mallard also noted the UWDC and BDNB are focused on ensuring that UPtoberfest attendees stay safe while having fun at the festival. “We are very conscious of wanting people to have a good time responsibly,” Mallard said. To this end, designated drivers can attend UPtoberfest at no cost and cab rides within a 50-mile radius are offered for free to festival attendees. Harris said that ticket sales for UPtoberfest have been stronger than ever this year. “We are on target to sell out sometime over the course of this week,” he said. Because of this, Ammel encouraged anyone interested in attending this year’s UPtoberfest to buy their tickets as soon as possible. “We’d love to have you join us and raise a glass for charity on our beautiful municipal dock in downtown Escanaba,” he said. Tickets to UPtoberfest can be purchased at Hereford and Hops, Upper Hand Brewery, Bobaloon’s Cafe and online at uptoberfest.org.